Soprano Lindsay Conrad is a vivacious, teasing Alice Ford, with a powerful, bright, three-dimensional tone. Her voice soared over the orchestra in the great arching melody Verdi gives her." ﻿"Lindsay Conrad made for a delightfully quick Sophie Arnould..."
"It didn’t hurt that Lindsay Conrad (who captivated me a couple of years ago as Alice Ford, the leading soprano role, in Boston Opera Collaborative’s appealing production of Verdi’s Falstaff) had the most beautiful voice and most solid vocal technique in the company." "Both Tamara Ryan, as the independent-minded Della, and Lindsay Conrad, as the formidable “Vampire Naysayer,” offer breathtakingly solid sopranos that soar and trill without ever becoming shrill or thin. Both develop three-dimensional characters, each with a wildly different approach to defying conventions." 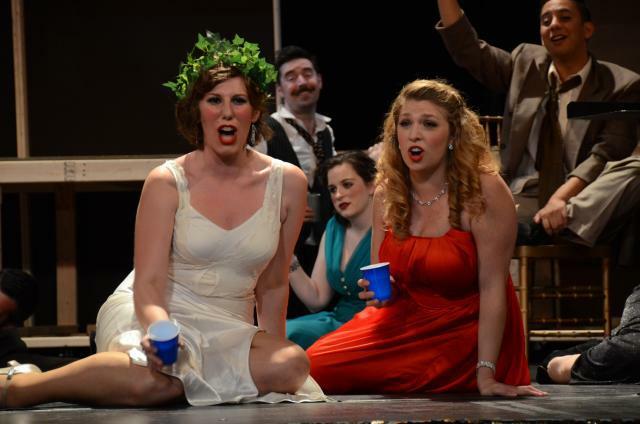 "Soprano Lindsay Conrad owned the room with her portrayal of the title character...Her stage persona is a cross between Bette Midler and Beverly Sills..."
"Conrad's voice soared and dominated in the best, character appropriate way..."
﻿"Lindsay Conrad is a vivacious, voluptuous Eurydice." 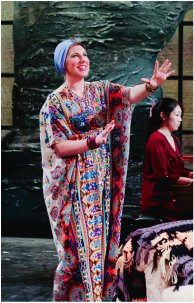 ﻿﻿﻿"Conrad is a natural comedienne whose “Quando m’en vo” was a bright-toned exercise in gleeful misbehavior; her Musetta was an appealingly shameless vamp." whose shimmering vibrato reminded me of Callas!"